This Bible may say "for Girls", but it's for any female! Beginning with the cover...White with pops of hot pink, turquoise & iridescent shimmer! If you have any of the other Inspire Bibles, you know that this one is sure to not disappoint. It's full of illustrations to color...500+! Also over 300 devotionals & prayers. Over 160 journaling prompts. Which I personally find fun! And so much more. This of course is perfect for girls, who love to color & create, all while drawing closer to Jesus. Art & Jesus...Can't go wrong there! It all helps you shine brightly for Him! 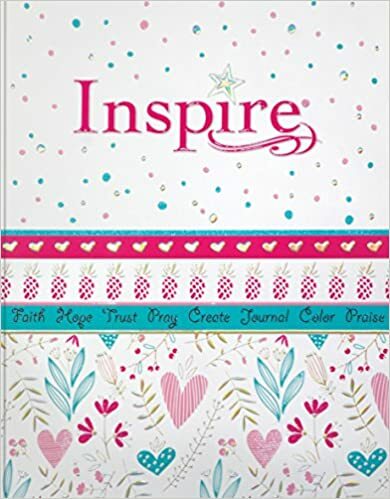 Inspire Bible for Girls is just another fabulous extension of the Inspire Bibles. Open up the word of with splashes of color! Tyndale sent this Bible to me to review for my honest review.